Buying a bicycle is not easy. There are many factors that need to be considered on how to buy a bicycle for adults or beginners. In spite of numerous opinions and suggestions from people, you are likely to make a mistake. Even if you get advice from cycling Facebook groups, cycling friends and shop keepers, mistakes happen. For a moment, when you get a brand new bicycle, everything seems perfect but not for long. It is only after a few rides you realise that you were given the wrong frame size or the wrong type of bike. Your knee starts hurting, your disc brakes make an annoying noise and what not! Living in a tech savvy world does have several advantages, but there are also its own drawbacks. With cycling growing day-by-day, it is very likely shop owners will try to sell you a bicycle. But you need to be prepared and well-versed to know whether it is the right one for you or not! But how can you prevent this? Well, we are here to help you. Just read the things to know before buying a bicycle below, they will help you buy a new bicycle! Before going ahead and settling on a bicycle, consider a budget that you are willing to spend on. Once the budget is fixed, other things will fall in place. Also, ensure to keep a 10% flexibility. The next question you need to ask yourself is, how much will you be cycling on a weekly or monthly basis? What is the purpose of buying a bicycle. Fitness, commute, training? If you have the answer to these question, move on to the next step. There are hundreds of bicycle brands available and choosing the right one can be difficult. Once you have decided on you budget and purpose, you can filter down to the type of bike. If your budget is below INR 30000 and your goal is to get fit, commute or light touring, then an MTB or a Hybrid is what you should be looking at. Wondering what MTB or Hybrid bikes are? There are also commuter bikes, fat bikes and foldable bikes that you can consider looking at. If you’re looking to race or get into long distance cycling, a road bike is a good idea. These bikes are sleek and fast. If you can handle speed, have good handling skills and have a higher budget, a road bike is good. Note: A simple Roadbike will cost you at least INR 30000. There are a few brands that will offer you a Roadbike below the above figure, but we advice to keep away. They won’t last you long and won’t offer you comfort or better durability. Think of a Tata Nano or a Maruti 800 for that matter. Also, if you’re a newbie and still have a budget, we advise you start from the bottom. Get a Mountain Bike first and build your way up. 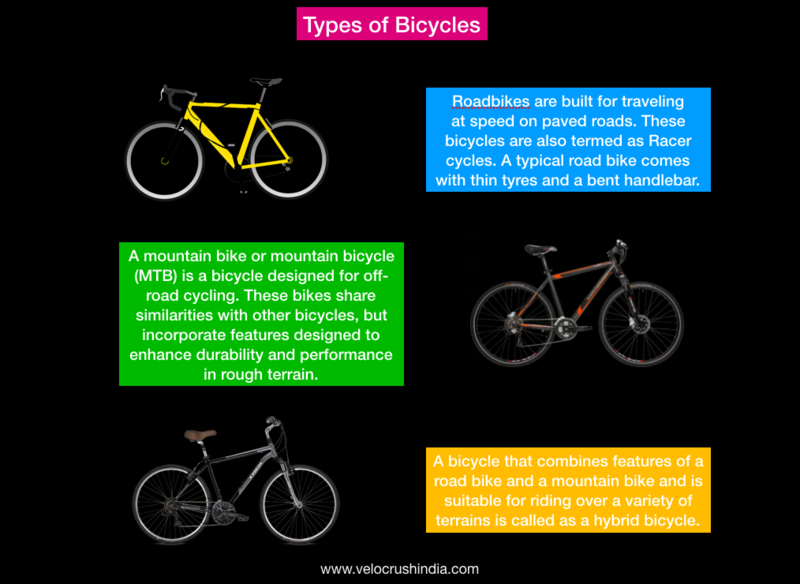 The bikes are a combo of road bikes and mountain bikes, hence the name Hybrid bikes. Long distance, fitness and touring can all be done on these types of bikes. A basic hybrid bicycle will cost you a minimum 15000 INR. Here’s a list of some of the entry level bikes you can look at. If you are looking for high end hybrid bicycles, a budget above INR 40000 will get you better geometry and high quality components. Now we have the mountain bike category. These bikes are very commonly found on Indian roads. You can use them for fitness, commute and bit of off roading (Hardtail). Here’s a list of some of the best bicycles under INR 10000. One you have decided on your budget, purpose and type of bike, you can now go about shortlisting a few bikes. Now consider looking at the components, wheels and other features. So what are the common features and how should you go about it? Firstly, you need to look at the components. Shimano and SRAM are renowned in this industry. Most of the bikes will come with these components only. Some might even come with a combo of both. However, there is a hirechey here as well. Good components will ensure smooth shifting just like butter on a hot pan. Another tip, a few years ago, when imported bicycles came to India, they used to come with good component. For instance, a Scott speedster 20 came with Shimano 105 for INR 98,000(exclusive of VAT). 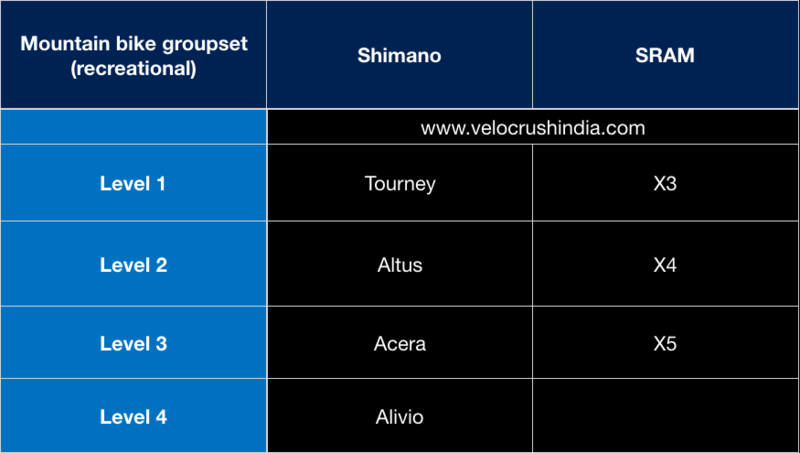 However, today, some of the bike shops offer the same bike with Shimano Claris and will cost you around INR 75,000. So do you know what does this mean? People do not understand bicycle components. Every bicycle shop owner knows this, so they downgrade the bikes and sell it. You might find bicycles with a decent suspension below INR 15000. It can take the beating from Indian roads but if you are looking for performance, you will have to invest more. Think about the Maruti 800 or a Tata Nano, they will be enough to get you from Point A to B but what about performance, comfort and other factors? There are also bicycles available with full-suspension. If you are into downhill mountain biking, only then these bikes are worth it. Planning to ride longer or just within the city, make one thing clear. You don’t need disc brakes! While many might disagree, for city riding or fitness, bicycles with V-brakes are good enough. However, if you do get a bike with disc brakes and go on longer rides, be ready to slow down and lag behind the pack. Also, disc brakes will require more attention and regular maintenance. A good marketing gimmick newbies usually fall far. Do not underestimate the importance of a bicycle frame. Just like the components and wheels a frame is equally vital. It is the foundation of your bicycle. Ensure to get the right frame as it may feel uncomfortable while cycling. If you are looking for a bicycle to commute, consider to go for a frame that carries the weight of your feet and bottom, and not your hands. Even the frame material makes a huge impact on your ride. Steel frames have been used for centuries by bicycle manufacturers. This material is durable, affordable but heavy. Today, these frames form the major chunk of the bicycle industry. Aluminium frames are a bit more expensive than steel frame, are lighter and do not rust. This material is light, stiff and resistant to corrosion. It is also very durable and expensive material when used on bikes. Very often people are excited to buy a bicycle. They go to a shop or see a major discount online and decide to pick it up. At times, they are also carried away by the shop-keepers and regret their choice later. Before you head out, here is the frame size that you need to consider according to your height. Thank us later! So don’t be a bakra! Keep these tips in mind and approach with caution. Go online and read a few reviews, try getting reviews from people who already owe the bicycle you wish to buy. Go to a store and take a test ride. Write to us and we will gladly help you. Take more if you need and once you decide, go ahead and pick the right size according to your height. Honestly, if there are online discounts, buying is completely your choice. Velocrush would never advise you to buy bikes online. We want you to go to the shops and test ride and buy! One of the reasons why we will never sell them online. If you are looking to buy a second-hand bicycle, here is the guide you should be reading. While some you might still be confused on how to buy a bicycle for adults, consider going for bicycles that offer value in the long term. Buying a big brand always doesn’t mean you have the best. hi, a very informative article indeed, especially the frame size part, i was fooled into buying small one(a ridiculous bike named Hercules Rocky)i have a little question of my own. I weigh on the higher side i.e. 112Kgs at the moment, just joined a college that provides me ample riding space in an uneven mostly tarmac conditions. Thank you so much Bhuvnesh. Glad you enjoyed reading it and was helpful. Do share it with others if you know any who are looking to buy a bicycle.